abhi - higher, special or exceeding + dharma- teaching, philosophy, thus making Abhidharma the "higher teachings"
abhi - about + dharma of the teaching, translating it instead as "about the teaching" or even "meta-teaching". Some in the West have considered the Abhidhamma to be the core of what is referred to as "Buddhist Psychology". Other writers on the topic such as Nyanaponika Thera and Dan Lusthaus describe Abhidhamma as a Buddhist Phenomenology while Noa Ronkin and Kenneth Inada equate it with Process philosophy. Bhikkhu Bodhi writes that the system of the Abhidhamma Pitaka is "simultaneously a philosophy, a psychology and an ethics, all integrated into the framework of a program for liberation." Abhidharma analysis also extended into the fields of ontology, epistemology and metaphysics. 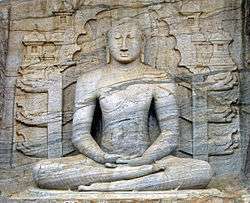 In the commentaries of Theravada Buddhism it was held that the Abhidhamma was not a later addition to the tradition, but rather represented in the fourth week of Gautama Buddha's enlightenment. Optimistic devas created a beautiful jeweled chamber after spent 3rd week dispelling mistrust and sitting inside it meditated on what was later known as the "Higher Doctrine". His mind and body were so purified that six-coloured rays came out of his body — blue, yellow, red, white, orange and a mixture of these five. The mixed color represented all these noble qualities. Later, he traveled to the Trāyastriṃśa and taught the Abhidhamma to the divine beings that dwelled there, including his deceased mother Māyā, who had re-arisen as a celestial being. The tradition holds that the Buddha gave daily summaries of the teachings given in the heavenly realm to the bhikkhu Sariputta, who passed them on. Numerous Abhidharma traditions arose in India, roughly during the period from the 2nd or 3rd Century BCE to the 5th Century CE. The 7th-century Chinese pilgrim Xuanzang reportedly collected Abhidharma texts from seven different traditions. The various Abhidhammic traditions have very fundamental philosophical disagreements with each other. These various Abhidhammic theories were (together with differences in Vinaya) the major cause for the majority of splits in the monastic Sangha, which resulted in the fragmented early Buddhist landscape of the 18 Early Buddhist Schools. However these differences did mean the existence of totally independent sects, as noted by Rupert Gethin, "at least some of the schools mentioned by later Buddhist tradition are likely to have been informal schools of thought in the manner of ‘Cartesians,’ ‘British Empiricists,’ or ‘Kantians’ for the history of modern philosophy." In the modern era, only the Abhidharmas of the Sarvāstivādins and the Theravādins have survived intact, each consisting of seven books, with the addition of the Sariputra Abhidharma. The Theravāda Abhidharma, the Abhidhamma Pitaka (discussed below), is preserved in Pāli, while the Sarvāstivādin Abhidharma is mostly preserved only in Chinese - the (likely Sanskrit) original texts having been lost, though some Tibetan texts are still extant. A small number of other Abhidharma texts of unknown origin are preserved in translation in the Chinese canon. These different traditions have some similarities, suggesting either interaction between groups or some common ground antedating the separation of the schools. These dharmas were seen as the ultimate entities or momentary events which make up the fabric of people's experience of reality. The conventional reality of substantial objects and persons is merely a conceptual construct imputed by the mind on a flux of dharmas. However, dharmas are never seen as individually separate entities, but are always dependently conditioned by other dharmas in a stream of momentary constellations of dharmas, constantly coming into being and vanishing, always in flux. Perception and thinking is then seen as a combination of various dharmas. Cittas (awareness events) are never experienced on their own, but are always intentional and hence accompanied by various mental factors (cetasikas), in a constantly flowing stream of experience occurrences. In the Visuddhimagga, the Theravada scholar Buddhaghosa characterizes the nature of conventional reality thus: "when they are seen after resolving them by means of knowledge into these elements, they disintegrate like froth subjected to compression by the hand. They are mere states (dhamma) occurring due to conditions and void. In this way the characteristic of not-self becomes more evident"(Vism-mhþ 824). Dhammasangani ('Enumeration of Factors') - Describes the fundamental phenomena (dhamma) which constitute human experience. Vibhanga ('Analysis') - An analysis of various topics by a variety of methods, including catechism, using material from the Dhammasangani. Dhatukatha ('Discussion of Elements') - Some interrelations between various items from the first two books, formulated as sets of questions and answers. Puggalapannatti ('Descriptions of Individuals') - An enumeration of the qualities of certain different 'personality types'. These types were believed to be useful in formulating teachings to which an individual would respond positively. Kathavatthu ('Points of Controversy') - A collection of debates on points of doctrine, traditionally said to have been compiled by Moggaliputta Tissa at the Buddhist Council sponsored by King Ashoka, which took place in the 3rd century, BCE. Yamaka ('The Pairs') - Deals with various questions relating to interrelations within various lists of items; here the items belong to the same list, whereas in the Dhātukathā they are in different lists. Patthana ('Foundational Conditions' or 'Relations') - The laws of interaction by which the dhammas described in the Dhammasangani operate. Visuddhimagga ("Path of Purification") by Buddhaghosa (5th century) - a comprehensive manual that contains much of the Theravada Abhidharma, one of the most popular texts in Theravada Buddhism. Abhidhammatthasangaha (Compendium of the Topics of the Abhidharma) by Anuruddha (12th century) - the most commonly used introductory manual in the contemporary Theravada tradition. Little research in English has been made in these texts, although all of them are summarized, many in fine detail, in the Encyclopedia of Indian Philosophies, Vol. 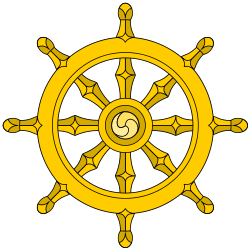 VII: Abhidharma Buddhism. Abhidharmakosha (Treasury of Higher Knowledge) by Vasubandhu - a highly influential commentary in Chinese and Tibetan Buddhism, which includes an auto-commentary by Vasubandhu, the Abhidharmakosabhasya, that critiques Sarvastivadin views from a Sautrantika perspective. This is the main text used to study Abhidharma in Tibet and East Asia. Nyayanusara-sastra (Conformance to Correct Principle) by Samghabhadra, an attempt to criticize Vasubandhu and defend Sarvastivada views. Abhidharmaāmrtaṛasa (The Taste of the Deathless) by Ghoṣaka. There is also plenty of Abhidharmic material in the Mahaprajnaparamita Upadesa, traditionally attributed to Nagarjuna. The Satyasiddhi School taught a progression of twenty-seven stations for cultivating realization, based upon the teachings of the Satyasiddhi Śāstra. The Satyasiddhi School took Harivarman as its founder in India, and Kumārajīva as the school's founder in China. The Satyasiddhi School is counted among the Ten Schools of Tang Dynasty Buddhism. From China, the Satyasiddhi School was transmitted to Japan in 625 CE, where it was known as Jōjitsu-shu (成實宗). The Japanese Satyasiddhi school is known as one of the six great schools of Japanese Buddhism in the Nara period (710-794 CE). 1 2 3 4 "Abhidhamma Pitaka." Encyclopædia Britannica. Ultimate Reference Suite. Chicago: Encyclopædia Britannica, 2008. ↑ See, for instance, Rhys Davids (1900), Trungpa (1975) and Goleman (2004). ↑ Lusthaus, Dan; Buddhist Phenomenology - A philosophical investigation of Yogacara Buddhism and the cheng wei-shih lun, page 4. 1 2 Bodhi, A comprehensive manual of Abhidhamma, page 3. ↑ "Buddhism." Encyclopædia Britannica. Ultimate Reference Suite. Chicago: Encyclopædia Britannica, 2008. ↑ Rupert Gethin in Paul Williams ed., "Buddhism: Critical Concepts in Religious Studies." Taylor and Francis 2005, page 171. ↑ Gethin, Rupert, 1998: The Foundations of Buddhism, Oxford and New York: Oxford University Press. ↑ Potter, Buswell, Jaini; Encyclopedia of Indian Philosophies Volume VII Abhidharma Buddhism to 150 AD, page 121. ↑ Bodhi, A comprehensive manual of Abhidhamma, page 3. 1 2 3 4 5 6 Ronkin, Noa, "Abhidharma", The Stanford Encyclopedia of Philosophy (Fall 2014 Edition), Edward N. Zalta (ed. ), URL = <http://plato.stanford.edu/archives/fall2014/entries/abhidharma/>. ↑ Siderits, Buddhism as philosophy, 112. ↑ K. L. Dhammajoti, Sarvāstivāda Abhidharma, page 187-188. ↑ Dhammajoti, K.L. Sarvastivada Abhidharma, page 183. ↑ Dhammajoti, K.L. Sarvastivada Abhidharma, page 189-. 1 2 Gethin 1998, p. 205. 1 2 Gethin 1998, p. 207. ↑ Peter Harvey, "An Introduction to Buddhism." Cambridge University Press, 1993, page 106. Ronkin, Noa. "Abhidharma". Stanford Encyclopedia of Philosophy.